Fred enter Army Feb 11. 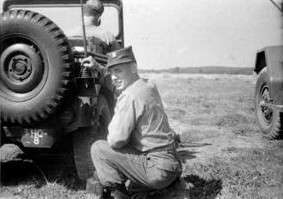 1957 took Basic training at Ft. Leonard wood Missouri. 2nd 8 Week Training AIT was with 553 Aviation Section Ft, Sill Oklahoma. Fred Served the 553 until it Consolidated and reassigned to 18th Artillery. 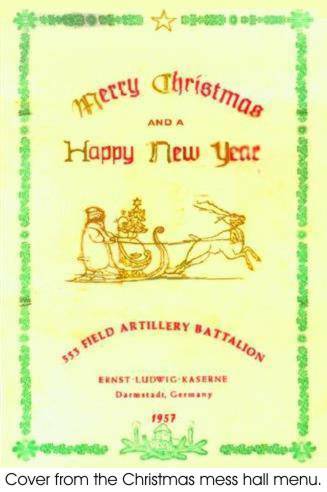 Fred was there when 553 patch was removed he put on the 18th Artillery June 25, 1958.
to view Military script used in Germany during the 50's. My grandfather fought in the Civil War and served in the 8th Michigan Calvary in company D. He was a prisoner that escaped and was disabled where he was awarded a permanent disability. I have his military records from the Department of Defense but can't find out much more. Maybe somebody has some information that can help. He was assigned the chief bugler after he returned to his company because he wasn't able to do his regular duties. He was captured during the battle around Atlanta and escaped somehow. He was MIA for some period of 30 days before making it back to his company. The history of his outfit is very interesting as to the number of times the fought the enemy. The time he was captured they had to fight their way out with sabers because of being out numbered and surrounded. They were recaptured later so that is when he later made his escape. If anyone can provide any info or pictures of the outfit I will greatly appreciate it. I am going to the VA to have them mark his grave with a Civil War Disabled Vet plaque. I found a site that specializes in Civil War / Michigan. They have a message board link on the home page where you can post a message and maby somebody will have some answers there. It looks like the site maintains a database of grave sites for Civil War / Michigan. A little more information on my grand father James Bolligar. After he returned to his outfit following the escape from the enemy and being unable to perform regular combat duties he was assigned the position as Chief Burglar and held this position until his discharge and release. This bit of information may be beneficial to locating more detailed information or pictures. I appreciate all the work that has been done on the web for me. I am trying to locate a picture of the 8th Michigan Calvary flag. The only picture that I have of it shows a badly torn and tattered remnant of it. The flag is a symbol of the hard battles fought and the lives lost. This morning I talked to a tour guide and artist at Michigan Archives there are 5 such flag `s and all 5 images will be sent to me. I want you when I get these later today or Monday pick out your Battle Flag. Fred all Flags are image on poster and we will get two one for our history and one for your BIO, This will show the world what a 8th Michigan flag Battle Flag look's like.